Health Canada’s primary objective in regulating pest control products is to protect Canadians’ health and their environment. Pest control products must be registered by Health Canada’s Pest Management Regulatory Agency ( PMRA ) before they can be imported, sold, or used in Canada. Pest control products must go through rigorous science-based assessments before being approved for sale in Canada. All registered pest control products must be re-evaluated by the PMRA on a cyclical basis to make sure they continue to meet modern health and environment safety standards and continue to have value. In 2015, Health Canada’s Pest Management Regulatory Agency ( PMRA ) published the outcome of its extensive Re-Evaluation of Glyphosate for public comment, which concluded that the products containing Glyphosate DO NOT PRESENT UNACCEPTABLE RISKS TO HUMAN HEALTH OR THE ENVIRONEMENT when used according to the revised product label directions. During this Re-Evaluation, the PMRA assessed the potential human health risk of Glyphosate from drinking water, food, occupational and BY-STANDER EXPOSURE, as well as the environmental risk to non-target organisms. Both the active ingredient and formulated products were included in the Re-Evaluation. The Re-Evaluation was carried out based on available information provided by the manufacturer of the pest control product, as well as a large volume of published scientific literature, monitoring information ( for example, ground water and surface water ) and reviews conducted by other regulatory authorities. • Glyphosate is NOT genotoxic and is UNLIKELY to pose a human cancer risk. • Dietary ( food and drinking water ) EXPOSURE associated with the use of Glyphosate is NOT expected to pose a risk of concern to human health. • Occupational and residential risks associated with the use of Glyphosate ARE NOT OF CONCERN, provided that updated label instructions are followed. • The environmental assessment concluded that spray buffer zones are necessary to mitigate potential risks to non-target species ( for example, vegetation near treated areas, aquatic invertebrates and fish ) from spray drift. • When used according to revised label directions, Glyphosate products are NOT expected to pose risks of concern to the environment. • All registered Glyphosate uses have value for weed control in AGRICULTURE and non-agricultural land management. All comments received during the consultation process were taken into consideration. Therefore, Health Canada’s Pest Management Regulatory Agency ( PMRA ) is GRANTING CONTINUED REGISTRATION of products containing Glyphosate with requirements of additional label updates to further protect human health and the environment. After a Re-Evaluation of the herbicide Glyphosate, Health Canada’s Pest Management Regulatory Agency ( PMRA ), under the authority of the Pest Control Products Act and Regulations, is GRANTING CONTINUED REGISTRATION OF PRODUCTS CONTAINING Glyphosate FOR SALE AND USE IN CANADA. An evaluation of available scientific information found that products containing Glyphosate DO NOT PRESENT RISKS OF CONCERN TO HUMAN HEALTH OR THE ENVIRONMENT WHEN USED ACCORDING TO THE REVISED LABEL DIRECTIONS. As a requirement for the continued registration of Glyphosate uses, NEW RISK REDUCTION MEASURES are required for the end-use products registered in Canada. No additional data are being requested at this time. Findings of the Re-Evaluation Of Glyphosate were first presented for public consultation in the Proposed Re-Evaluation Decision PRVD2015-01 [ See link below ], Glyphosate, whereas this Re-Evaluation Decision ( RVD2017-01 ) summarizes the Agency’s final decision on the Re-Evaluation Of Glyphosate and the reasons for it. Comments received during the consultation period were taken into consideration. These comments and new data/information resulted in revisions to some parts of the RISK ASSESSMENTS, however, they DID NOT result in substantial changes to the proposed regulatory decision as described in PRVD2015-01. Appendix I of Re-Evaluation Decision RVD2017-01, Glyphosate summarizes the comments received and provides the PMRA’s response. To comply with this decision, the required mitigation measures must be implemented on all product labels sold by registrants no later than 24 months after the publication date of RVD2017-01, Glyphosate. Registrants of the products containing Glyphosate will be informed of the specific requirements affecting their product registration(s) and of the regulatory options available to them. What Does Health Canada Consider When Making A Re-Evaluation Decision ?!?! Re-Evaluation draws on data from registrants, published scientific reports, information from other regulatory agencies and any other relevant information. Glyphosate is a broad-spectrum, non-selective herbicide. It controls many annual weeds, perennial weeds, woody brush and weedy trees. It is registered for use on a wide variety of sites including terrestrial feed and food crops, terrestrial non-food, non-feed and fibre crops, and for non-agricultural, industrial and residential weed management for non-food sites, forests and woodlots, outdoor ornamentals and turf. Glyphosate is present as the free acid or as a salt in formulated end use products. Glyphosate products are formulated as solutions, pastes or tablets and can be applied using ground or aerial application equipment. Other application techniques are also used to apply Glyphosate, such as with a wiper or wick applicator, cut stump or stem injection treatment. The rate of application ranges from 0.25 to 4.32 kg a.e./ha, depending on weed species ( for example, annual vs. perennial ) and use site. All products containing Glyphosate currently registered under the authority of the Pest Control Products Act are listed in Appendix II of RVD2017-01, Glyphosate. Can Approved Uses Of Glyphosate Affect Human Health ?!?! POTENTIAL EXPOSURE to Glyphosate may occur through diet ( food and water ), or when handling and applying the product, or by entering treated sites. • the levels to which people may be exposed. The dose levels used to ASSESS RISKS are established to protect the most sensitive human population ( for example, CHILDREN and nursing mothers ). Only those uses where EXPOSURE is well below levels that cause NO EFFECTS in ANIMAL TESTING are considered acceptable for registration. Glyphosate is of LOW ACUTE ORAL, DERMAL, and INHALATION TOXICITY. It is SEVERELY IRRITATING TO THE EYES, NON-IRRITATING TO SKIN AND DOES NOT CAUSE AN ALLERGIC SKIN REACTION. Registrant-supplied SHORT- AND LONG-TERM ( LIFE-TIME ) ANIMAL TOXICITY TESTS, as well as numerous peer-reviewed studies from the published scientific literature were assessed for the potential of Glyphosate to cause neurotoxicity, immuno-toxicity, chronic toxicity, cancer, reproductive and developmental toxicity, and various other effects. The most sensitive end-points for RISK ASSESSMENT were clinical signs of toxicity, developmental effects, and changes in body weight. The young were more sensitive than the adult animals. However, the RISK ASSESSMENT approach ensures that the level of EXPOSURE to humans is well below the lowest dose at which these effects occurred in animal tests. REFERENCE DOSES define levels to which an individual can be exposed over a SINGLE DAY ( ACUTE ) or LIFE-TIME ( CHRONIC ) and EXPECT NO ADVERSE HEALTH EFFECTS. Generally, DIETARY EXPOSURE from food and water is acceptable if it is less than 100 per cent of the ACUTE REFERENCE DOSE or CHRONIC REFERENCE DOSE ( Acceptable Daily Intake, ADI ). An Acceptable Daily Intake ( ADI ) is an estimate of the level of DAILY EXPOSURE to a residue that, over a LIFE-TIME, is believed to have NO SIGNIFICANT HARMFUL EFFECTS. POTENTIAL ACUTE and CHRONIC DIETARY EXPOSURES to Glyphosate were estimated from residues of Glyphosate and relevant metabolites in both treated crops and drinking water. EXPOSURE to different sub-populations, including CHILDREN and women of reproductive age, were considered. The ACUTE DIETARY EXPOSURE estimate from food and drinking water at the 95th percentile represents 31 per cent of the Acute Reference Dose ( ARfD ) for females 13-49 years of age, and ranges from 12 per cent to 45 per cent of the ARfD for all other population sub-groups. The CHRONIC DIETARY EXPOSURE ESTIMATE for the general population represents 30 per cent of the Acceptable Daily Intake ( ADI ). EXPOSURE estimates for population subgroups range from 20 per cent of the ADI ( for adults aged 50 years or older ) to 70 per cent of the ADI ( for CHILDREN 1-2 years old ). Thus, ACUTE AND CHRONIC DIETARY RISKS ARE NOT OF CONCERN. The Food and Drugs Act prohibits the sale of adulterated food; that is, food containing a residue of pest control products that exceeds the established Maximum Residue Limit ( MRL ). MRLs of pest control products are established for Food and Drugs Act purposes through the evaluation of scientific data under the Pest Control Products Act. Each Maximum Residue Limit ( MRL ) value defines the maximum concentration in parts per million ( ppm ) of a pest control product allowed in or on certain foods. Food containing a residue that DOES NOT exceed the established Maximum Residue Limit ( MRL ) DOES NOT POSE A HEALTH RISK CONCERN. The Canadian Maximum Residue Limit ( MRL ) for Glyphosate is currently specified for a wide range of commodities ( MRL data-base ). Residues in all other AGRICULTURAL COMMODITIES, including those approved for treatment in Canada but without a specific MRL, are regulated under Subsection B.15.002(1) of the Food and Drug Regulations, which requires that residues do not exceed 0.1 ppm. Separate Maximum Residue Limits ( MRLs ) have been established for the trimethyl-sulfonium ( TMS ) cation, the major metabolite of the Glyphosate-TMS salt, in/on a variety of commodities. Given that all Glyphosate-TMS-containing products have been DISCONTINUED in Canada, all Maximum Residue Limits ( MRLs ) for the TMS cation will be REVOKED. NON-OCCUPATIONAL SCENARIOS, like RESIDENTIAL EXPOSURE, may occur from the application of products containing Glyphosate to residential lawns, and turf ( including golf courses ), gardens and trees. RESIDENTIAL HANDLER EXPOSURE could occur from mixing, loading, and applying domestic-class Glyphosate products. These products can be applied as a liquid by a manually pressurized hand-wand, back-pack, sprinkler can, and ready-to-use sprayer. RESIDENTIAL POST-APPLICATION EXPOSURE may occur for persons performing activities on treated areas. This includes areas treated by residential handlers as well as residential areas treated by COMMERCIAL APPLICATORS. INCIDENTAL ORAL EXPOSURE may also occur for CHILDREN ( 1 to < 2 years old ) playing in treated areas. For all domestic class products, the target DERMAL and INHALATION Margins Of Exposure ( MOE ) were met for adults applying Glyphosate ― and ARE NOT OF CONCERN. Residential post-application activities also met the target DERMAL Margins Of Exposure ( MOE ) for ALL POPULATIONS ( including golfers ) ― and ARE NOT OF CONCERN. For INCIDENTAL ORAL EXPOSURE, the target oral Margins Of Exposure ( MOE ) were met for CHILDREN ( 1 to < 2 years old ) ― and ARE NOT OF CONCERN. NON-OCCUPATIONAL SCENARIOS were aggregated with background ( chronic ) DIETARY EXPOSURE ( food and drinking water ). The resulting aggregate risk estimates reached the target Margins Of Exposure ( MOE ) for ALL USES ― and ARE NOT OF CONCERN. BY-STANDER EXPOSURE may occur when the general public enter non-cropland areas ( for example, hiking through forests or parks ) that have recently been treated with Glyphosate. The resulting risk estimates associated with BY-STANDER DERMAL EXPOSURE met the target Margins Of Exposure ( MOE ) for ALL POPULATIONS ― and ARE NOT OF CONCERN. Risks to handlers ARE NOT OF CONCERN for ALL SCENARIOS. Based on the precautions and directions for use on product labels reviewed for this Re-Evaluation, risk estimates associated with mixing, loading, and applying activities met the target DERMAL and INHALATION Margins Of Exposure ( MOE ) ― and ARE NOT OF CONCERN. POST-APPLICATION OCCUPATIONAL RISK ASSESSMENTS consider exposures to workers entering treated sites in AGRICULTURE. Based on the current use pattern for AGRICULTURAL SCENARIOS reviewed for this Re-Evaluation, post-application risks to workers performing activities, such as scouting, met the target DERMAL Margins Of Exposure ( MOE ) ― and ARE NOT OF CONCERN. A MINIMUM RESTRICTED ENTRY INTERVAL ( REI ) OF 12 HOURS IS REQUIRED FOR AGRICULTURAL SITES. As part of the Re-Evaluation, the effect of Polyethoxylated Tallow Amines ( POEA ) was included. POEA is a family of several compounds that are used as SURFACTANTS in many Glyphosate products registered in Canada. NO human health risks of concern were identified for these end-use products, provided that they contain no more than 20 per cent POEA by weight. All of the currently registered Glyphosate end-use products in Canada MEET THIS LIMIT. What Happens When Glyphosate Is Introduced Into the Environment ?!?! When Glyphosate is released into the environment, it can enter soil and surface water. Glyphosate BREAKS DOWN IN SOIL AND WATER, and is NOT EXPECTED TO REMAIN FOR LONG PERIODS OF TIME. Glyphosate produces ONE MAJOR BREAK DOWN PRODUCT IN SOIL AND WATER, Aminomethyl Phosphonic Acid ( AMPA ), which can last in the environment. CARRY-OVER of Glyphosate [ and AMPA ] into the NEXT GROWING SEASON is NOT EXPECTED TO BE SIGNIFICANT. Glyphosate [ and AMPA ] are NOT EXPECTED TO MOVE DOWNWARD THROUGH THE SOIL and are UNLIKELY TO ENTER GROUNDWATER. Glyphosate dissolves readily in water but is expected to move into sediments in aquatic environments. Glyphosate is NOT EXPECTED TO ENTER THE ATMOSPHERE. Glyphosate [ and AMPA ] are UNLIKELY TO ACCUMULATE IN ANIMAL TISSUES. In the terrestrial environment, the only risk identified was for terrestrial plants, therefore, SPRAY BUFFER ZONES ARE REQUIRED to REDUCE EXPOSURE to sensitive terrestrial plants. Glyphosate formulations POSE A NEGLIGIBLE RISK to fresh-water fish and amphibians, but may POSE A RISK to fresh-water algae, fresh-water plants, marine/estuarine invertebrates, and marine fish if exposed to high enough concentrations. HAZARD STATEMENTS AND MITIGATION MEASURES ( SPRAY BUFFER ZONES ) are required on product labels to protect aquatic organisms. Glyphosate, AMPA, and POEA DO NOT meet all Toxic Substances Management Policy ( TSMP ) Track 1 criteria and are NOT considered Track 1 substances. Other than incident reports of damage to plants and one exceptional incident regarding fish in a river ( PRVD2015-01, Section 4.2.3 ), THERE ARE CURRENTLY NO ENVIRONMENTAL INCIDENT REPORTS INVOLVING Glyphosate IN CANADA. As part of the Re-Evaluation, the METABOLITE AND TRANSFORMATION PRODUCT Aminomethyl Phosphonic Acid ( AMPA ) is also included. CARRY-OVER of AMPA into the NEXT GROWING SEASON is NOT EXPECTED TO BE SIGNIFICANT. AMPA is NOT EXPECTED TO MOVE DOWNWARD THROUGH THE SOIL and is UNLIKELY TO ENTER GROUNDWATER. AMPA is UNLIKELY TO ACCUMULATE IN ANIMAL TISSUES. Certain Glyphosate formulations include a SURFACTANT composed of POEA compounds. At high enough concentrations, POEA is toxic to aquatic organisms but is NOT EXPECTED TO REMAIN IN THE ENVIRONMENT. While, in general, Glyphosate formulations that contain POEA are MORE TOXIC to fresh-water and marine/estuarine organisms than formulations that DO NOT contain POEA, they DO NOT POSE RISKS OF CONCERN TO THE ENVIRONMENT WHEN USED AS DIRECTED ON THE LABEL. What Is The Value Of Glyphosate ?!?! • Due largely to its broad and flexible use pattern and its wide weed-control spectrum, it is the most widely used herbicide in several major crops grown in Canada, such as canola, soybean, field corn and wheat. It is also one of only a few herbicides regularly used in fruit orchards, such as apple. • It is the essential herbicide for use on Glyphosate Tolerant Crops ( GTCs ), including canola, soybean, corn, sweet corn and sugar beet. The combination of GTCs and Glyphosate has been adopted as an important agricultural production practice in Canada. • It has a wide application window ranging from pre-seeding to after seeding ( prior to crop emergence ), in-crop, pre-harvest or post-harvest, providing a flexible and effective weed management program. • It is one of a few herbicides that can also be used as a harvest management and desiccation treatment. • Post-harvest stubble treatment with Glyphosate allows reduced or zero tillage, which has facilitated the adoption of conservation agriculture that results in improved soil quality. Glyphosate is also an important weed management tool and is widely used for weed control in non-agricultural land management, such as forestry, industrial areas, and along rights-of-way. It is an effective tool for control of many invasive weed species and is also used in the control of toxic plants, such as poison ivy. Labels of registered pest control products specific instructions for use. Directions include RISK-REDUCTION MEASURES to protect human health and the environment. These directions must be followed by law. As a result of the Re-Evaluation of Glyphosate, Health Canada’s Pest Management Regulatory Agency ( PMRA ) is requiring FURTHER RISK-REDUCTION MEASURES in addition to those already listed on Glyphosate product labels. Additional RISK-REDUCTION MEASURES are discussed below. Label amendments to be implemented are found in Appendix IV of RVD2017-01, Glyphosate. • To protect commercial and residential applicators ― Glyphosate is NOT TO BE APPLIED USING HAND-WICKING OR HAND-DAUBING METHODS. • To protect workers entering treated sites ― a Restricted-Entry Interval ( REI ) of 12 hours is required for AGRICULTURAL USES. • To protect BY-STANDERS ― a statement is required indicating that the product is to be applied only when the potential for drift to areas of human habitation or areas of human activity, such as houses, cottages, schools, and recreational areas, is minimal. • ENVIRONMENTAL HAZARD STATEMENTS are added to inform users of toxicity to non-target species. • SPRAY BUFFER ZONES to protect non-target terrestrial and aquatic habitats are required. • To REDUCE THE POTENTIAL FOR RUN-OFF of Glyphosate to adjacent aquatic habitats, precautionary statements for sites with characteristics that may be conducive to RUN-OFF and when heavy rain is forecasted are required. In addition, a VEGETATIVE STRIP between the treatment area and the edge of a water body is recommended to REDUCE RUN-OFF of Glyphosate to aquatic areas. Health Canada’s Pest Management Regulatory Agency ( PMRA ) routinely works collaboratively with other member countries within the Organisation for Economic Co-operation and Development ( OECD ) on the regulation of pest control products. As part of the Re-Evaluation of an active ingredient, the PMRA takes into consideration recent developments and new information on the status of a pest control product in other jurisdictions. Glyphosate is currently acceptable for use in other OECD countries, including the United States, Australia and the European Union. 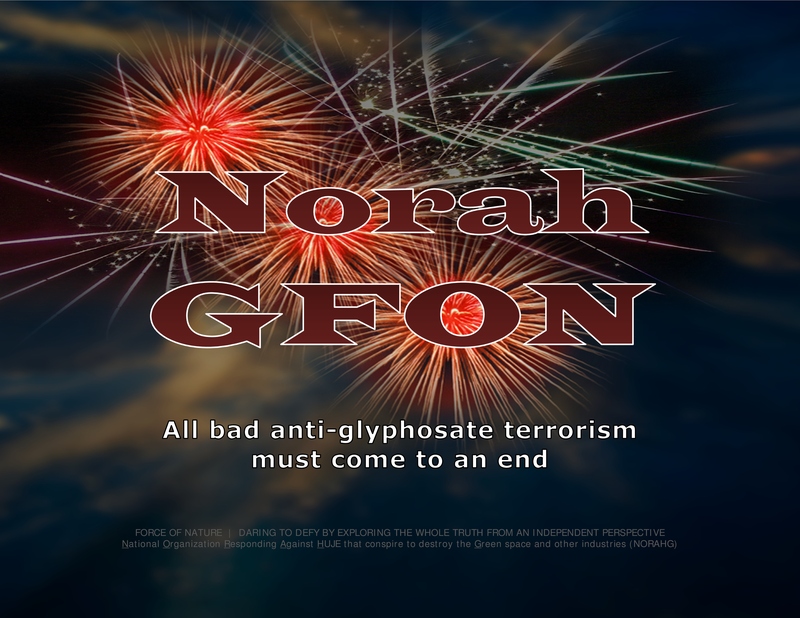 As of March 8th, 2017, NO decision by an OECD member-country to prohibit ALL USES of Glyphosate for health or environmental reasons has been identified. In March, 2015, the World Health Organization’s ( WHO ) International Agency for Research on Cancer ( IARC ) published a summary of results of their hazard classification of five pest control products, including Glyphosate. IARC classified Glyphosate as probably carcinogenic to humans. It is important to note that the IARC classification is A HAZARD CLASSIFICATION AND NOT A HEALTH RISK ASSESSMENT. This means that the level of human exposure, which determines the actual risk, was NOT taken into account by IARC. INTERNATIONAL AGENCY FOR RESEARCH ON CANCER ( IARC ) HAS BEEN DISCREDITED ! 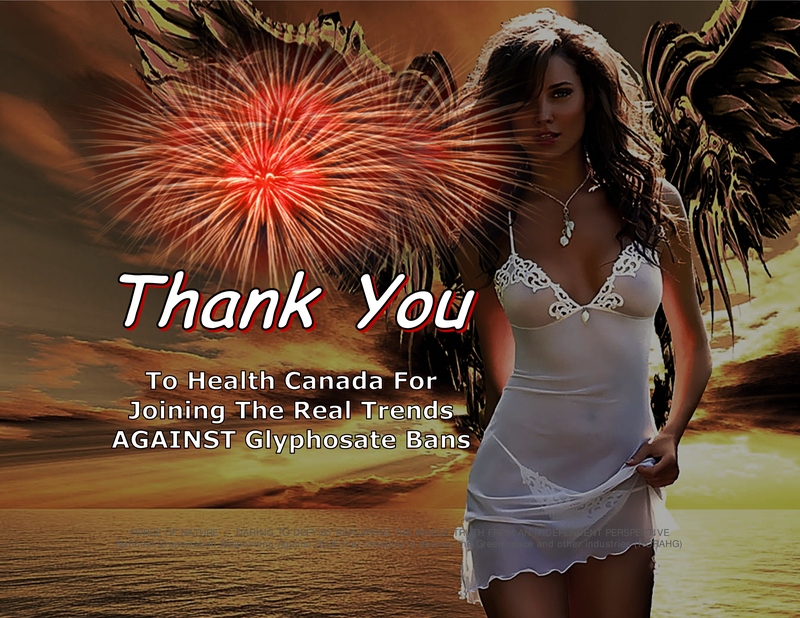 ― GLYPHOSATE WILL NOT CAUSE CANCER ! IARC Has NOT Proven That Glyphosate Causes Cancer. And We Repeat, IARC Has NOT Classified Glyphosate As Group 1 – Carcinogenic To Humans. Glyphosate WILL NOT cause cancer ! According to U.S. Environmental Protection Agency ( US EPA ), German Federal Institute For RISK ASSESSMENT, Health Canada, and EVERY other science-based national regulatory agency in the world, the weight of evidence is AGAINST carcinogenicity. In other words, according to these agencies, glyphosate WILL NOT cause cancer. The IARC report of hazard did NOT indicate the risk of getting cancer. On the other hand, national regulatory agencies, like US EPA and Health Canada, DO evaluate risks. IARC merely looked at what is called hazard, and NOT risk. It DID NOT take into consideration how much of, or how commonly, a risk glyphosate poses in the real world. IARC failed to provide any new research concerning glyphosate. If the IARC hazard report against glyphosate was truly valid, then why hasn’t WHO itself demand more government regulation ?!?! Why should national regulatory agencies listen to IARC when it is ignored by WHO ?!?! In fact, glyphosate WILL NOT cause harm and WILL NOT cause cancer ! In November, 2015, the European Food Safety Authority ( EFSA ) finalized their re-assessment of Glyphosate, concluding that Glyphosate is UNLIKELY to pose a carcinogenic hazard to humans. The European Union ( EU ) also set an acute reference dose, which is the same as that set by the PMRA ( PRVD2015-01 ). In May 2016, the Joint /WHO Meeting On Pesticide Residues ( JMPR ) concluded that Glyphosate is UNLIKELY to be genotoxic at anticipated dietary exposures and that it is UNLIKELY to pose a carcinogenic risk to humans from EXPOSURE through the diet. In March, 2017, the European Chemical Agency ( ECHA ) and the Australian Pesticides and Veterinary Medicines Authority ( APVMA ) released their determination that Glyphosate is NOT a carcinogen. Currently, NO pesticide regulatory authority, including Health Canada, considers Glyphosate to be a carcinogenic risk of concern to humans. EXPERT-SCIENTISTS AT EUROPEAN FOOD SAFETY AUTHORITY ( EFSA ) SAY GLYPHOSATE UNLIKELY TO CAUSE CANCER ! On November 12th, 2015, the European Food Safety Authority ( EFSA ) announced that ― « Glyphosate Is Unlikely To Cause Cancer In Humans ». EFSA functions as an advisor to policy-makers in the European Union ( EU ). The evidence DOES NOT support the International Agency For Research On Cancer ( IARC ) and its BOGUS classification of glyphosate. On March 20th, 2015, the IARC’s hazard-study arbitrarily classified glyphosate, the active ingredient in Roundup, as « probably carcinogenic » [ ?!?! ] on the basis of « limited evidence ». IARC’s use of the term « limited evidence » clearly implied that its hazard-study was SEVERELY FLAWED, DISTORTED, and UNBALANCED. EFSA scientists, who worked with experts from nations in the European Union ( EU ), said their study DIFFERED from the IARC’s in that it considered only glyphosate, whereas the IARC had ASSESSED GROUPS OF RELATED CHEMICALS. IARC’s study alleged that toxic effects could be related to reactions with other constituents. [ ?!?! ] The conclusions of the European Food Safety Authority ( EFSA ), following the peer review of the initial RISK ASSESSMENTs carried out by the competent authority of the rapporteur Member State Germany, for the pesticide active substance glyphosate are reported. Canada and the US EPA have been collaborating on the Re-Evaluation of Glyphosate. In December 2016, the US EPA Scientific Advisory Panel ( SAP ) discussed the cancer potential of Glyphosate, and Health Canada’s Pest Management Regulatory Agency ( PMRA ) participated as an observer. The final SAP meeting report was posted on March 17th, 2017. The PMRA is continuing to monitor regulatory activities from other regulatory organizations, including the US EPA’s review of the SAP recommendations and final determination regarding the potential carcinogenicity of Glyphosate. THE UNITED STATES ENVIRONMENTAL PROTECTION AGENCY ( US EPA ) IS SUCCESSFULLY SEPARATING A HEALTH SCARE FROM A HEALTH THREAT ! On September 12th, 2016, the US EPA reported that Glyphosate DOES NOT CAUSE CANCER. According to the US EPA, « the available data at this time DO NOT SUPPORT A CARCINOGENIC PROCESS for Glyphosate ». The US EPA’s assessment of Glyphosate was based upon an extensive data-base exists for evaluating the carcinogenic potential of Glyphosate, including 23 epidemiological studies, 15 animal carcinogenicity studies, and nearly 90 genotoxicity studies for the active ingredient Glyphosate. On April 29th, 2016, the US EPA had also classified Glyphosate as « Not Likely To Be Carcinogenic To Humans », the SAFEST CLASSIFICATION on the scale. The US EPA’s assessment of Glyphosate DISCREDITED the anti-Glyphosate report by International Agency for Research on Cancer ( IARC ) which CONVENIENTLY DISREGARDED SEVERAL STUDIES on the effects of exposure to Glyphosate purely on the basis that these studies showed NO positive results. The US EPA report also noted that the studies IARC chose to include in its report had SIGNIFICANT LIMITATIONS. Additionally, IARC’s anti-Glyphosate report was based on a review of the scientific literature that WAS NOT COMPREHENSIVE. IARC DELIBERATELY OVERSTATED THE RISKS with its arbitrary and selective « cherry picking » studies against Glyphosate. NO PESTICIDE REGULATOR IN THE WORLD CONSIDERS GLYPHOSATE TO BE A CARCINOGEN, and both US EPA reports once again reinforce this important fact. The US EPA is successfully separating a health scare from a health threat ! Health Canada’s Pest Management Regulatory Agency ( PMRA ) sets Maximum Residue Limit ( MRL ) for residue of pest control products on food, which is the maximum amount of residue that is expected to remain on food products when a pest control product is used according to label directions. These are set at levels well below the amount that could pose a health concern. In 2015, the Canadian Food Inspection Agency ( CFIA ) tested approximately 700 samples consisting of a variety of juice and juice blends, grains and grain products, beans, lentils, and a wide variety of fruit and vegetables. The CFIA also initiated a targeted survey of approximately 2,500 samples, looking at levels of Glyphosate in bean, pea, lentil, chickpea, and soy products, as well as less commonly consumed grains such as barley, buckwheat, and quinoa. The results show a high degree of compliance with the Maximum Residue Limit ( MRL ) established by the PMRA for Glyphosate. The CFIA anticipates having the full analysis completed by Spring 2017. There are almost fifty jurisdictions that have stopped, or rescinded, or limited, or temporarily, or beginning to repeal anti-pesticide prohibitions & restrictions, or granted commercial businesses with an exception status, along with several moral victories. There are more and more tremendous victories against anti-pesticide terrorism. Has Been Snapped ( Proverbially ) ! For The Environment ( CAPE ) Be Next ?!?! Can An Audit By Canada Revenue Agency Be Next ?!?! Will Be Snapped ( Proverbially ) ! Revenue Service Be Next ?!?! WE SPEAK THE WHOLE TRUTH ABOUT GLYPHOSATE FROM AN INDEPENDENT PERSPECTIVE ! Not surprisingly, enviro-fanatics have demonstrated that they are incapable of processing overwhelming scientific evidence. Should we trust these fanatics, who conveniently ignore scientific evidence, and attempt to impose their politicized-doctrines and twisted life-style choices against our society ?!? !